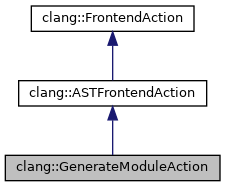 Definition at line 107 of file FrontendActions.h. Definition at line 162 of file FrontendActions.cpp. References clang::FrontendAction::BeginInvocation(), clang::FrontendAction::BeginSourceFileAction(), clang::FrontendOptions::BuildingImplicitModule, clang::LangOptions::CMK_HeaderModule, clang::LangOptions::CMK_ModuleInterface, clang::CompilerInstance::createDefaultOutputFile(), clang::CompilerInstance::createOutputFile(), clang::PCHContainerWriter::CreatePCHContainerGenerator(), clang::LangOptions::CurrentModule, clang::HeaderSearch::getCachedModuleFileName(), clang::CompilerInstance::getDiagnostics(), clang::CompilerInstance::getFrontendOpts(), clang::Preprocessor::getHeaderSearchInfo(), clang::CompilerInstance::getLangOpts(), clang::CompilerInstance::getModuleCache(), clang::Module::getModuleInputBufferName(), clang::CompilerInstance::getPCHContainerWriter(), clang::CompilerInstance::getPreprocessor(), clang::FrontendOptions::Inputs, clang::FrontendOptions::ModuleFileExtensions, clang::None, clang::FrontendOptions::OriginalModuleMap, clang::FrontendOptions::OutputFile, clang::FrontendAction::PrepareToExecuteAction(), clang::DiagnosticsEngine::Report(), and clang::InputKind::Source. For AST-based actions, the kind of translation unit we're handling. Definition at line 115 of file FrontendActions.h. Definition at line 119 of file FrontendActions.h.